from Loud Alien Noize, Its Tobe Damit! While they have yet to share the stage in a collaborated performance, and with last contact so explosive, it took a Pastor, a mental health advocate and the show’s producer to stop a swirling storm, he and Person understand and genuinely admire one another. Bad news for Tampa, as the return of Tobe turns Montreal into the runaway favorite… Damit! But a few days ago, Michael reshared An Angel Without Wings, an epic tribute to his Mother (RIP), if there ever was. Its weight handled with strength and grace, such love and pride in every letter of what I image to be a 6000 word or more essay. It both breaks one’s heart and celebrates a mother’s love with an evenness that spreads, allowing each reader to think of their own Mother, while honoring Johns’. But it is his loss to carry and what a heavy burden to bear: one of the great hurts of life. But on the surface, he honors commitments and makes us laugh, and I am honored to have him still here. I have offered hints and suggestions to each of the players and their captains, when asked. Michael has not, but I left one anyway in the comment section of a Facebook post. If he understands, the solution he never thought imaginable, can be imagined in the next 4 days. And if the idea captures Michael, he may very well deliver such a performance, that the male version of Rebecca Lemke could be the only comparison. Or he will fulfil an obligation. There are supporting actors to be sure. Long term residents, recipient and future recipient of The Neighborhood Award ‘OUR HIGHEST HONOR’, The Neighborhood 2017 co-Chairs and Team Captains in Cities. Guy White (#TeamMontreal) and Kelly Lewis (#TeamTampa) have performed the normal duties, including a nasty expulsion for plagiarism and disqualifying of an entire city (Baltimore) a first for sure. But what no chair has ever done, is lead a team to the peak, where there is only victory for one. What Montreal lacks in a focused attack, they make up in depth. With resident Nadine Jordan and newcomer Xtine Layne joining forces with co-MVP Frances Waterman, their capture should be a formidable one. And while Tobe Damit could upstage everyone in the final act, make no mistake, even with Guy as Captain, Team Montreal belongs to Waterman. 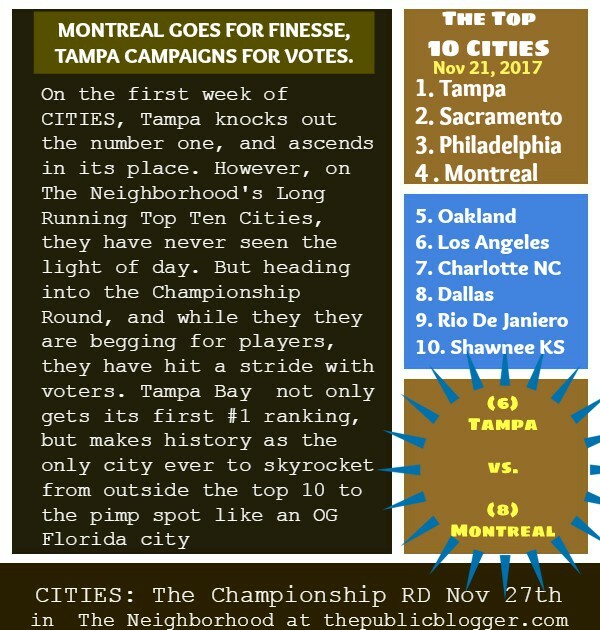 But if Vegas odds were on the line, even without knowing who or how many others from Tampa and Montreal are planning a capture, The Montreal Team 10-1: Michael Mele 5-1 and Tobe Damit – even money. Imagination, laser sharp attention and a desire to win for their city, then holding their breath while the public votes and panels judge, in a final separation of the victor and the defeated. But with the 2017 City of the Year on the line, others are out there capturing a solution… as it happens.